Whiter and brighter cardstock. 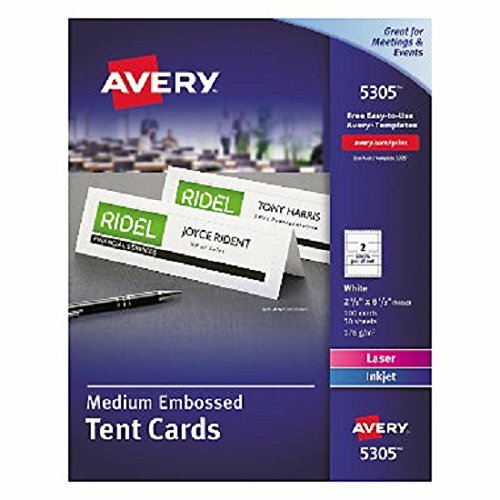 Create professional tent cards, place cards, name plates and more. Great for conferences, tradeshows, training meetings, catering and classrooms. Prescored for easy folding. Customize easily with free Avery designs and templates. 8 1/2 x 11 sheets. For laser and inkjet printers. For a professional appearance. Paper Colors: White Finished Card Size: 2 1/2amp;quot; x 8 1/2amp;quot; Card Quantity: 100 Sheet Quantity: 50. Finished_Card_Size - 2 1/2" x 8 1/2"